Haley Hallenbeck in action during a game this season. The Butler lacrosse team is now 3-6 on the season. Jimmy Lafakis/Collegian file photo. The Butler lacrosse team went 1-2 during a road trip in North Carolina and South Carolina over Spring Break. The Bulldogs’ win over Wofford was sandwiched between losses to Gardner-Webb and Furman. Butler lost to Gardner-Webb 13-12 on March 10 in Boiling Springs, North Carolina. The Bulldogs’ Karina Latsko got on the board first, but Butler fell to an early 3-1 deficit. Sydney Pattison, Ashley Guerra and Holly Hall all scored in the first half, but Butler found themselves down seven goals early in the second half. Eight straight Butler goals from Ashley Steffes, Latsko, Hall, Lindsey Schreiber, Pattison, Haley Hallenbeck and two from Katelyn Murphy put the Bulldogs up 12-11 with under nine minutes to go. Butler wouldn’t score again, Gardner-Webb did so twice and victory was snatched out of the Bulldogs’ hands. 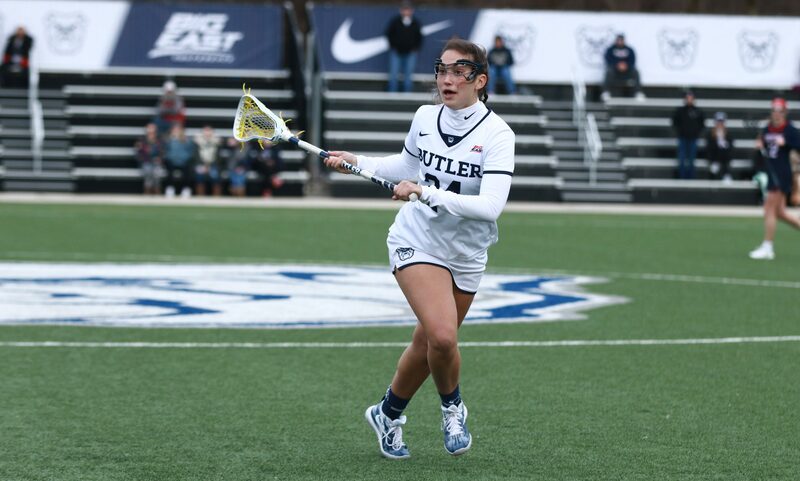 Butler followed up the loss with a 17-10 win over Wofford on March 13 in Spartanburg, South Carolina. The Bulldogs got on the board seven times before surrendering a goal to Wofford. Layla Tattersfield, Hallenbeck, Steffes, Guerra and Hall all scored once in the stretch. Schreiber did so twice. After three more Butler goals, from Steffes, Guerra and Pattison, the Bulldogs held a commanding 10-1 lead. Wofford cut Butler’s lead to five, but could never get it closer. Guerra scored three more times, for a total of five goals in the game. Madeline Hooks scored her first two goals of the season in the second half as well. Steffes also scored once more to complete a hat trick in the contest. As well as the Wofford game went for Butler, the Furman game went at least as poorly. The Paladins took care of the Bulldogs by a score of 13-2 on March 15 in Greenville, South Carolina. Kailee Callaghan and Guerra scored Butler’s only two goals. After the trip, Butler is 3-6 on the season. Butler’s three wins this year surpass its total in its first two seasons as a program. The Bulldogs are back in action at Vanderbilt on March 24.